Cake for breakfast? Yes, please! Running for the First Aid kit first thing in the morning? No, thank you. Grating carrots before your first cup of coffee might be a little dangerous. I may or may not know that from experience. But if you can pull yourself out of that morning haze and be careful, these pancakes are definitely worth the risk! I’ve seen all kinds of crazy dessert-like pancakes on Pinterest lately. Red velvet pancakes, birthday cake pancakes, brownie batter pancakes. Hard to resist! 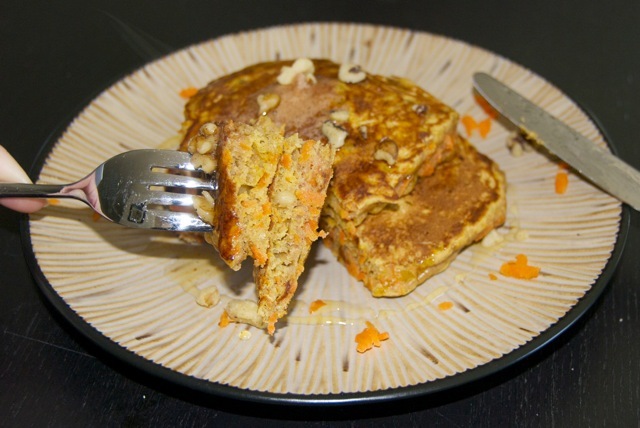 Carrot cake pancakes seemed like the least of all the evils… at least they have veggies in them! Combine flour and next 7 ingredients (through ginger) in a large bowl, stirring with a whisk. 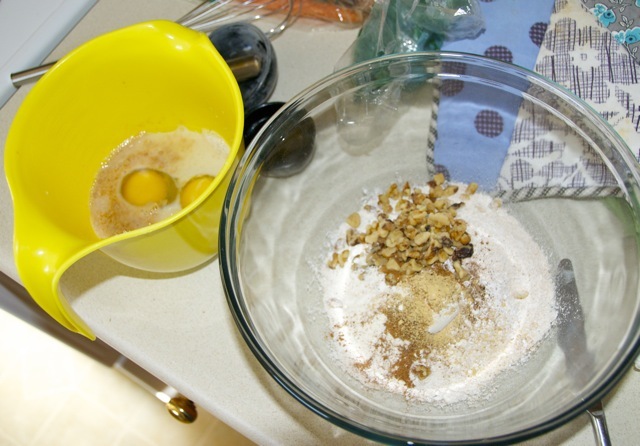 In another bowl, combine brown sugar, buttermilk, oil, vanilla and eggs. 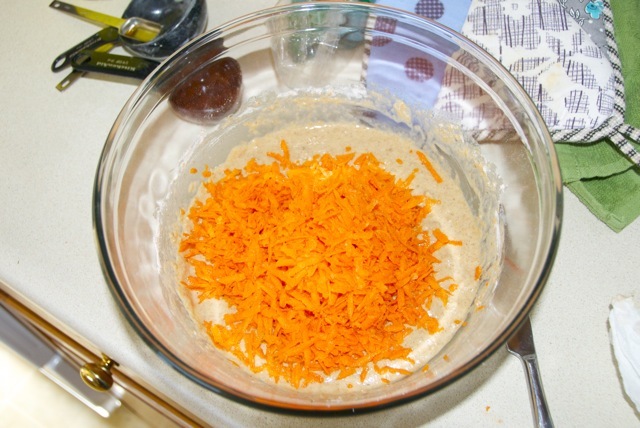 Add wet ingredients to dry, stirring just until moist. Fold in carrots. Heat a large nonstick skillet over medium heat. Coat pan with cooking spray or butter. Ladle batter onto pan, spreading with a spatula. Cook about 2 minutes or until tops are bubbling and edges look cooked. Carefully flip pancakes and cook another minute or until bottoms are lightly browned. You could serve the pancakes with syrup, but I think these particular cakes go better with butter and honey! 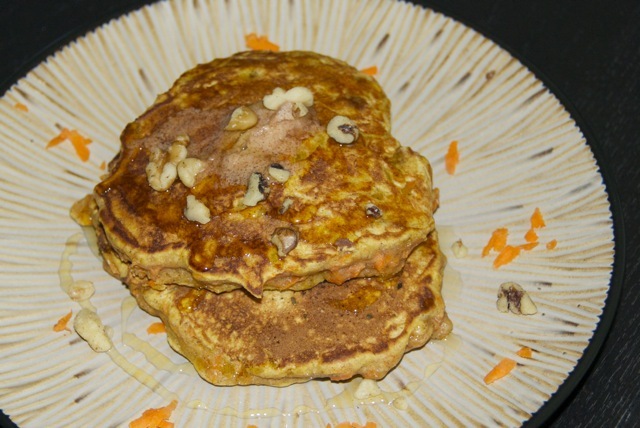 The pancakes weren’t quite as decadent as cake, but they were definitely a yummy breakfast. 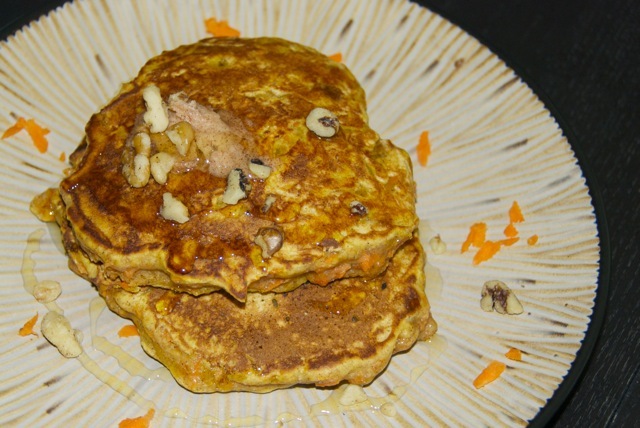 And they were actually pretty nutritious too, with the carrots, walnuts and whole wheat flour. Of course, this was supposed to be 6 servings and it ended up being about 2.5 for us. Oh well, can’t win ’em all!